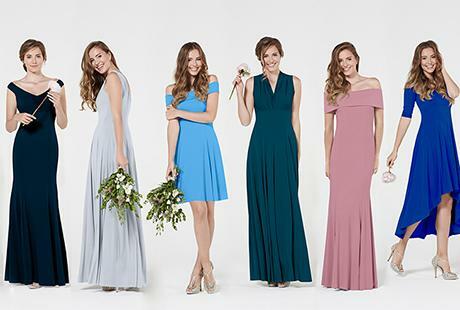 Sassi B is the perfect combination of elegant styles, flattering shapes and beautiful colours giving brides and bridesmaids the freedom to create their own individual look. This delicious collection is made up of 28 combinations, mixing a range of tops with different skirts, so that the finished look could be, for example, one-shoulder or off-the-shoulder, V-neck or scooped, with short and sassy skirts to swishy fishtails, and fi and flare to high-low. Stretch jersey that helps sculpt the figure and smooth the silhouette is a key ingredient and the colour choice covers a rainbow of options so there is something for every taste. All Sassi B gowns are handmade in the UK. This collections get a real thumbs up from us.